Tulip shells are pretty shells with splotches of reddish-brown, orange or dark maroon pink color. 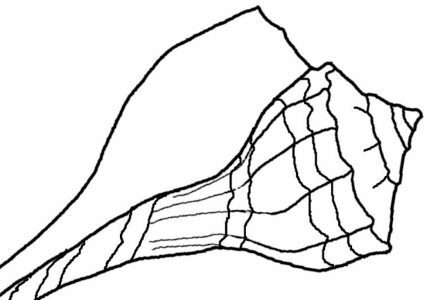 Both the True tulip and Banded tulip have horizontal lines on the shell surface. This Banded Tulip (Fasciolaria ilium) was found at a construction site near the water. I assume that over the years as sand was moved around the shell ended up inland. This is the only tulip shell in my collection. Tulip shells – both have hermit crabs inside. This is how they look underwater in the wild. I found these two together (hermit crabs inside) with the smaller riding piggy-back on the larger. The True Tulip (Fasciolaria tulipa) is one of the bigger shells I see out on the islands. I was out boating recently when I found the two shells in the pictures above. The one I am holding in the picture below measured around 6 inches long, although my seashell ID book says they grow to only 5 inches. I found it in the backwater of the Indian River near an oyster bed at low tide. It had an oyster shell attached inside, and was home to a hermit crab. These photos show some of it’s color beneath all that muck, and the size. It was a beauty. Even in these less desirable states, the markings on the shells obviously differ. The lines (bands) going around the True Tulip (smaller shell in photos above) whereas the shell below is much more splotchy. If I’d been able to collect it, the colors after cleaning would have been beautiful. The shape of the shells are similar, but the True grows larger. The True has ridges at the top of each whorl and the lines are not as distinct and wide-set. This one will eat the Banded. Both types of tulips live on sand, and there is plenty of that around here. I see the True more than I see the Banded, but don’t have one in my collection. Because they are the perfect home for hermit crabs, I was excited to find an empty shell once and brought it home, but then….read more. I found this amazing video made by Pam Rambo who writes the blog “i love shelling”. She lives on Sanibel Island, and when you watch her video, you will see why it’s one of the best places in the world for shell collecting. All those shells……!!!!!!! On Sanibel Island (Florida’s Gulf coast) she can find more beautiful shells in one day than I will find in a lifetime of beach combing over here on the East coast. I go nuts over finding one Dosinia shell (the white bivalves in her video), and she bypasses tons of them! The black shells are pen shells, and she even sees starfish (sea stars) on shore. In her video you will see lots of tulips, alive and not, and watch her add some beauties to her collection (which must be huge). Apparently empty seashells outnumber the hermit crabs in Sanibel. Amazing shells! I’d never heard of ‘tulip shells’ but they gorgeous especially when cloaked in that rosy pink color! I agree, they are very nice looking shells. Tulips shells are stunning. Thank you for sharing yours and the video. What beautiful colours. I agree. I love the tulip shells, and would love to find one to keep one day. I feel your pain when it comes to finding specimens that have hermit crabs in. I was snorkelling in Greece a couple of years ago and collected a handful of beautiful cerith and triton shells. I got back to the beach and excitedly spread them out on a towel to show my wife; when they all decided to get up and started to walk back to the water! Seashells that “walk” are not my favorite ones! I have a bunch of banded tulips – all found on Sanibel – in childhood, and my trip there 2 years ago. I live in SC, and I have found the best shelling here is Foley Beach near Charleston. For whatever reasons, I always find lovely olive and whelk shells there – empty, but in nice condition. And other random finds. Edisto Island, SC always seems to be considered the best shell place – and that puzzles me. I’ve been there several times and the only shells I found were battered pieces of shells. Sometimes piles of them – but all battered pieces, many bleached white by sun. Whole, intact shells rare, and even then in bad shape. I love Edisto, but not for shelling. Just watching that video I included of shelling at Sanibel makes me green with envy. But then I tell my self I have more fun and adventure because I must search (for months / years?) to find a super shell like one of those. Your info is interesting. I’d love to visit the beaches in the Carolinas and do some shell collecting.